I've had the particular advantage of learning in a variety of alternative schools. Of course, a definition of "alternative" relies on there being a set mainstream idea of education: which I believe there isn't. But there have been many educational movements which have chosen to separate themselves from U.S. public schools under the banner of the alternative, including unschooling, Waldorf, democratic schools, and Montessori. My first opportunity as an educator happened at a Montessori preschool and K-8 elementary/middle school. I have a few criticisms of the Montessori philosophy (the interpretation of which changes not only with each school, but with each teacher). Most revolve around its replicability, or the ability to set up the typical Montessori classroom. Maybe a little background information is needed. The philosophy was started by Maria Montessori when she set up a school for poor urban children in Rome, Italy, in 1907. As with any philosophies which have also become a practice, there is contention between those who want to retain the pure and original intentions of the "Montessori Method" (if such thing actually exists and is, again, replicable) and those who would rather have it adapt with the times and, in my opinion, relevant changes in education and child psychology; also in my opinion, Maria Montessori's ideas about the spiritual "embryo" and its development can be refuted by contemporary learning theory. 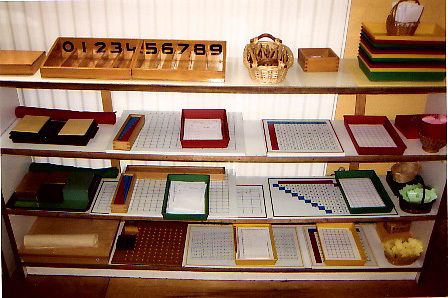 However, the core of a Montessori school is its particular materials; the picture above shows a shelf containing math work designed for children from kindergarten (or late preschool) to middle elementary. A Montessori classroom without its specific materials is, in fact, not much of a Montessori environment at all; most of the class work time is devoted to students (by themselves, in groups, or with the aide of a teacher) manipulating work, proceeding from a set beginning to a set end. M. Montessori originally designed her materials to be easily reproducible in the cheapest materials of the day: specifically wood. Her materials have remained unchanged although a variety of cheaper production methods (particularly plastics) have been developed. Nienhaus, a quintessential manufacturer of Montessori equipment, charges more than $150 for wooden Red Rods, only a small part of a typical Montessori classroom. The expense of basic educational materials has continued, I believe, for the following reasons: 1) proponents of the Montessori method enjoy the aesthetics of quality-made wood materials; 2) most Montessori schools, being private and often for-profit enterprises, can subsidize the price of materials by charging its students higher tuition; 3) arguably, private industry has retained specific prices to what remains a small consumer base of schools, teachers, and the occasional parent. The result of reliance on expensive materials has made it impossible to apply the Montessori Method, in its typical application, to schools in developing countries, where basic equipment such as pencils, paper, desks, and even a school building itself may not be present. In fact, it is rumored that the cost to outfit one classroom with the basics, including furniture, begins at $10,000. In which originally began as an effort to provide cheap and tactile materials to poor urban children has become an empire of loosely connected and, in some cases, poorly managed private schools for the preschoolers of the wealthy. The preschool craze of the last decade, in which the privileged vie for a few spots in choice early preparatory schools has only expanded this stereotype and funded the rise of Montessori classrooms around the developed world. There are a few more criticisms of Montessori education, outside of its relative cost and reliance on outdated, turn of the century learning theory; some of these, given the variety of philosophies under the Montessori banner, may be addressed by different schools. Most use of Montessori materials strictly adheres to fairly rigid and methodical use. When I was in Montessori teacher training, our instructional materials consisted of step-by-step, extraordinarily specific guides to using each piece of educational work in the classroom. According to writings by and about Maria Montessori, she favored a much more experimental and less systematic approach; in one of her books, she advocates throwing the material around, something which would undoubtedly be verboten in the contemporary classroom. At the same time, individual freedom is encouraged while creativity is often curbed. As long as materials are used systematically, creativity with them is discouraged; there can be a lot of "we don't do it that way, we do it this way" in a Montessori classroom. John Dewey advocated creativity and adaptation in education while at the same time criticizing the Montessori Method's lack of it. [Monart, a so-called "progressive" approach to painting which advocates a collective repeating of basic elements in a classic "banking approach" to art education; coincidentally, I came to dislike this style at a Montessori elementary.] Maria Montessori also discouraged imagination in education and in its stead advocated a concretely reality-based learning; in particular this horrifies teachers who place storytelling and creative activities in the center of their classroom. Individual learning is preferred while social interaction is discouraged, whether intentionally or not. Arguably preschool, more so than any other level, is the environment for the most formative social learning; kids are not only learning how to interact with others, but understanding their place within a community. Often, time in a Montessori class are spent either alone with materials, or in a circle group led by the teacher. In my opinion, not enough time is spent in small group activity; and, in fact, much social interaction outside of work is discouraged (my theory to explain this is that collaboration between students is difficult to facilitate, especially when teacher training is not suited to train for it). I think contemporary theories of and projects for group learning, peer interaction, and collaborative work are important at any level, particularly for developing skills particular to this contemporary era (often described as 21st century skills). Of course, there are important elements of my teaching style that I obviously and freely borrowed from my experience at a Montessori school, whether they arose from the philosophy itself or, more realistically, the techniques and, well, swagger of my educator peers. I enjoy the idea of demonstrating something to students, and allowing them to practice and repeat independently until they "get it"; I like the holistic approach, taking one concept, and spending a week on it, breaking it down into different elements which compose projects, events, activities, and interactions; I like bringing the ecosystem into the classroom and the classroom into the ecosystem; and lastly, I take seriously that idea that the teacher and researcher are, in fact, one in the same: in this way, every classroom is a laboratory for learning. This is a great article. I wish you'd cited your sources so that I could use this for a research paper! Regardless, great piece. Thanks for sharing! I am not sure where you taught or where you did the Montessori training, but where I teach we do not discourage the students from creating their own small groups and working together 90% of the time. Now, there are a handful of works in the classroom that take a good deal of focus and these activities are only for a single person, but the vast majority of the work can be done by 1, 2, or 3 students. In fact in her own handbook Montessori herself did in fact, encourage children to form their own spontaneous learning groups. Thanks for your comment. It's good to hear there is some group learning within the Montessori approach; my experience and observations were different - in fact, from what I've seen, each school offers a different crystalization of the method, tailored to the environment and the teachers' own philosophies. Despite the critical tone of my post, I had a fascinating time visiting the world of Montessori. I also feel sorry for the bad examples you must have had...the core of Montessori is the WAY not the materials, extensive scientific research by polk-lillard shows that not only is Montessori a good method, these children do better later on in school and life. You speak from own experience, and nor research....not an accurate portrayal of Montessori at all. Hi, thanks for the comment. Just wanted to clarify, this is of course an accurate portrayal of my own experience, not a summary of research. Please don't feel sorry for any bad examples. I saw great schools with happy children. It's just unfortunate that the materials and resources are so expensive that, with some exception, only affluent children can benefit. I totally agree......I can make the materials myself. I also went through montessori training....and then discouraged. Many urban districts can't afford the pricey material. When I went to visit several montessori schools and asked teachers/parents about the humble orgins of montessori......the parents were often offended that this method started as an urban solution. this is a good article, pinpointing features of Montessori. I was looking for more information on the Montessori Method when I came across your article. I found it interesting because it actually contradicted (except for the materials used in class, which I didnt think of at all) what I thought the Montessori education would be like. And then I read the comments and then of course realized that i had assumed that all Montessori schools would be like the one you taught in. So my point is this: since different Montessori schools have a different way of implementing the Montessori method, is there any way for me to figure out which Montessori school best suits me without relying on Internet reviews? Should I check the teachers' certification, classroom settings, etc? Great question, and one I don't have the answer too. All schools and even classrooms are different, as the Montessori Method was never incorporated or standardized. So some schools use the method very well but also bring others contemporary standards of learning theory, while others do little of the method outside of just having the name. Also because there is no central accreditation, some Montessori schools may fall beneath the standards of other preschools or Kindergarden in topics they cover, and, most importantly, safety and health issues. It's hard to say what Montessori school would suit you - do you want one that is more traditional, and practices the original method with Maria Montessori's materials? Or one that incorporates other learning theories but is still centered around the Montessori methodology? - Is the school accredited by the American Montessori Society? I doesn't have to be, but one that is went through a rigorous process, including curriculum, governance, facilities, and health/safety standards. - Do teachers have ECE credentials or credits? This is not required by all states, or some states require a certain amount of teachers or lead teachers to have certification. Isn't a clear indicator of a good school, but a school that's willing to pay more for teachers with standard training is a good sign. - Do teachers have Montessori credentials? Usually, the lead teacher in a classroom will have spent a summer or a year getting a certificate. This, like Montessori schools, is not standardize, and the quality of each certificate varies; sometimes knowledge of Montessori and training at the school is more than adequate. A Montessori school without trained and knowledgeable Montessori teachers is just a preschool with the name attached. - The classroom environment. The Montessori method is centered around learner independence, so a skilled teacher will allow children, even small, to move independently and use materials (that they know how to use) by themselves. It will look like organized chaos. It's a subtle balance - too much chaos, and it's just daycare, without the basic structure needed for learning. Too little chaos, and the teacher or assistants are asserting too much control, beyond what's necessary with the method. - Ask about how the children are being prepared for entry to public Kindergartens and elementary schools. A skilled teacher will be aware of public school standards and having an organized curriculum to prepare the children; hopefully they will be exceeded minimum standards, not just barely making them. Too many schools confuse independent learning with not staying on top of their students' education. - Like any private school, be aware of health and safety standards. Do a little research into the minimum qualifications that your state has for preschools and private schools - like where trash is located, bathroom facilities, and possible hazardous chemicals. You'd be surprised what some preschools do and don't do. So as I wrote, I don't think the Montessori Method is some magical panacea compared to an equally pragmatic, diverse, and competent non-Montessori preschool. But, in my experience, families with the resources to send their children to quality Montessori schools with competent and knowledgeable teachers have good experiences. It's what you make of it, I guess. Hi, I'm fairly new to Montessori as I have a 3 year old and 1 1/2 year old and have only recently started to research educational systems. I think part of the biggest problem of Montessori is the fact that it is not "controlled" and that there are many people out there calling themselves Montessori who are in fact not. But if you exclude those and we just focus on "actual" Montessori schools, you mention the reliance on outdated teaching ideas. However, I think that current systems are really not much different from what they were a hundred years ago either. Of course, there's just a general goal of what is to be taught and more freedom as to how to accomplish that which can be both a good and a bad thing. In general, I find that I "trust" the Montessori materials more than I "trust" that teachers in a standard school to impart the concepts that are needed to develop a strong foundation. And it's not that I think that teachers in the standard systems are worse than those in Montessori, it's just that it seems like when they aren't good, they can stray further than in the Montessori system. And it just seems like it would be far easier to allow the children to "teach themselves" and then monitor the areas they are weak in rather than actively try to them everything systematically. I'm not sold yet on Montessori elementary education. Also, I think that parents can supplement the social aspects that might be missing from a Montessori education far more easily than they might supplement the academic. I have a friend who is supplementing his child's math education using montessori materials because the highly rated school he is at barely teaches his first grader anything. I think the social aspect that MIGHT be missing from Montessori would be far easier to provide than teaching your child math on the side. I also was "trained" in Montessori and left for the various reasons you described. I was a public Montessori teacher and the school praised Montessori, yet did the "best" they could to implement (common core, testing, etc). The breaking point was when I was told to write a curriculum and the curriculum was not based on student outcomes but on the Montessori materials. I never heard of this in my life!!!!! I was told I was wrong, and deal with it. I was fortunate to attend a Montessori school during my elementary years. Unfortunately, I was forced to attend a public school during high school, as few Montessori schools extend into secondary education. My public school, despite being listed amongst the country's top ten at the time of my attendance, was entirely remedial. Thus, I offer my own comparative analysis to the author's critique of the Montessori Method. The author is first and foremost correct that Montessori schools vary widely, because the name is unlicensed thereby permitting anyone to incorporate "Montessori" into the school's title. A genuine Montessori school will primarily rely on the materials and augment with books, but only if the child shows interest in the books. The author, when discussing the price of Montessori materials, fails to acknowledge the government's meddling in the educational system. The government, both at the Federal and State level, has granted an undue monopoly to the Traditional System of Education. This subsidy diverts resources away from the private sector and causes economic imbalances, such as an artificial rise in the cost of competitive systems like Montessori. Criticizing the rigidity of Montessori materials, which are designed to root abstract ideas in concrete and practical form, is like criticizing gravity for not allowing humans to fly. Nature imposes limitations, particularly in the form of scarce resources. Similarly, the Montessori environment aids a child's creative efforts by directing those efforts towards productive ends, as opposed to counter productive ends and waisting the student's time. For example, my passion for writing was encouraged by fellow Montessori students. For example, a Montessori friend wrote a short story set in the universe of Star Trek, a television show that captivated my attention. His story inspired me to begin writing. We were fifth graders that critiqued each other's work on the merits of originality and character development; proceeded to act out the adventures during recess; and I was particularly driven to master the teleplay format and submit scripts to Star Trek's freelance writing department during the show's production. John Dewey, alongside Horace Mann, should be entirely dismissed as educators. As communists, they advocated a system of education that would encouraged the child's conformity and reliance upon government. The Traditional Method of education can be traced back to the Prussian model, which was designed to stop Prussian soldiers from fleeing the battlefield and instill a blind allegiance to the State. It is no coincidence that Traditional method based schools reflect political hierarchies. In fact, Dewey contradicts himself in his criticism of Montessori when he says, "But there is no freedom allowed the child to create. He is free to choose which apparatus he will use, but never to choose his own ends, never to bend a material to his own plans. For the material is limited to a fixed number of things which must be handled in a certain way,” (Schools of Tomorrow, 1915); and, "The mere absorbing of facts and truths is so exclusively individual an affair that it tends very naturally to pass into selfishness. There is no obvious social motive for the acquirement of mere learning, there is no clear social gain in success thereat.” (The School and Society, 1899). Creativity is an individual affair and poses a great threat to the State. Finally, social interaction is greatly encouraged in the Montessori multi-age classroom, which permits free association, peripheral learning, and peer instruction. To the contrary, the Traditional Method of Education discourages social interaction through: fear, isolation, and intimidation; peer instruction is often considered cheating; and homework takes away from family time. I could expand upon this with countless examples. Public education should be avoided at all costs. Thank you for this article. This is the first one I have seen that mentions some of the drawbacks I noticed when observing, mainly the "we do it this way, not that way." I noticed this in particular when my daughter, who is four, went to look at a puzzle and one teacher (who, to her credit, was warm and friendly) told her that it was too big and gave her one she could have completed at age 2 instead. Once the teacher walked away, my daughter started purposely putting the pieces in the wrong spots and laughing about it. Another little girl came over, got upset, and kept telling my daughter, "No!!!! That's WRONG. You're doing it WRONG!" to which the response was, "I want to do it this way." I told my kid that if she wanted to leave she would have to put away the puzzle, and in order to put away the puzzle, she had to put it together the way it was. So, of course she put it together in a minute, and the teacher came by after the fact to explain how one of the pieces was a rectangle. Besides her strong will and affinity for being quietly difficult to the point where a teacher might assume she just doesn't get it, my kid falls into the "imaginative" category. She enjoys fairy tales and drawing random things from her imagination. She will sit and color for hours sometimes. She won't even tell people her real name. She is "Scar" from the Lion King. She told her dad that she was going to magically put a dress on him, then cut him open to put a "womb" inside of him to make him a woman. She thinks ground beef looks like a small intestine. She is just too quirky for this systematic style. I know (I hope) that one day she will connect the dots and work on the skills she needs to more thoroughly express her ideas, but right now she needs a place where she feels safe and is not constantly told she is doing it wrong. She loves her slightly more structured preschool. She needs a kindergarten teacher who will appreciate her strengths and find a fun way to keep her enjoying the learning process. She has no trouble learning; she just sees the responsibility part as a turn off sometimes. She loves homework, and that is probably because I told her she didn't have to do it and because she is not in school for a full day. Maybe Montessori schools teach some kids independence, but my kid is naturally so independent I fear it might make her feel stifled. In a montessori kindergarten and it is an absolute relief to me to read this article. Absolute truth. It also depends on the teachers and officials who are responsible for following the system in the best way possible. I'm sure not many teachers would be aware of the differences between the public schools and a montessori one. It is my experience that too many Montessori establishments and teachers, use the methodology as a cult-like dogmatic approach, that suggests there are right and wrong ways to educate. This is counter intuitive to any authentic learning laboratory, which must always be open to innovation and reinvention - within the framework of discovering the most effective-affective learning/assessment models. All learning, irrespective of the brand-name, resources and egos involved, is good learning if it can be proven to be effective.